SUE Solutions successfully completed the Quality Level ‘B’ and Quality Level ‘A’ utility locating services for the SR-10; Ferron to Rock Creek Bridge project located in Emery County, Utah, for UDOT Region 4. 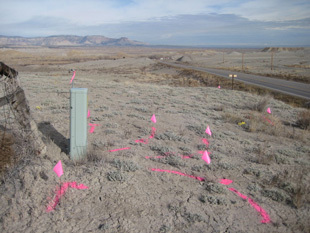 SUE Solutions contracted with a UDOT project design consultant to perform the utility investigation tasks on this project. The project is to include roadway and shoulder widening, and the addition of passing lanes, acceleration lanes, and turn lanes. SUE Solution’s Scope of Work included both Quality Level ‘B’ designating (horizontal), and Quality Level ‘A’ (vertical) locating services. 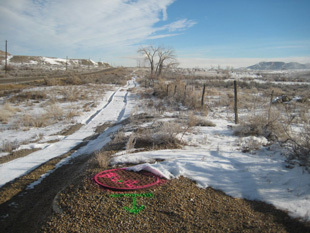 The Phase I designating services were completed in January of 2011, and the Phase II Quality Level ‘A’ test holes were completed in April 2011. Approximately 126,000 feet of Level ‘B’ designated utilities were located, surveyed, and mapped as part of the utility investigations, as well as ten (10) test holes being performed. Utility coordination efforts with existing utility owners, and local utility locating contractors also took place to account for those utilities that were not locatable by conventional means. SUE Solutions located utilities which included culinary and secondary water, phone, CATV, fiber optics, electrical, natural gas, sewer, storm drain, and several pressurized irrigation lines. SUE Solutions was able to locate these utilities ahead of schedule and under budget. The final deliverable to the Design Consultant consisted of a comprehensive final SUE report which contained existing utility conditions and their limitations, photographs of designated utilities, survey data, CAD files, test hole data sheets, test hole photographs, survey files, and existing utility owner mapping.